Why do the majority of food and beverage outlets close within the first three years? Singapore-based Red Hare Studios owner Dr Koh Wee Lit (picture) studied the question and decided that it is because most business owners are unable to create a consistent customer experience, especially after they expand the business. Red Hare Studios developed computer games, but in 2012, Koh started diversifying into other sectors in the hope of creating a more sustainable future for his game developers. That was how he came up with his idea for the F&B industry. From his observation, he realised that there was much to be done and technology could help. “We found that 59% of F&B businesses close within three years of opening. It could be because there was not enough start-up capital, they had poor knowledge of the competition or they chose the wrong location. And then there is poor restaurant promotion, so no one knows about the business,” says Koh. But most importantly, restaurants close because of the inconsistent customer experience, he says. “Business owners are sometimes so engrossed with what they are doing that they forget about the processes they have put in place. Then of course, if your business is good, you need to stock up on raw materials to ensure that you have food to serve customers. 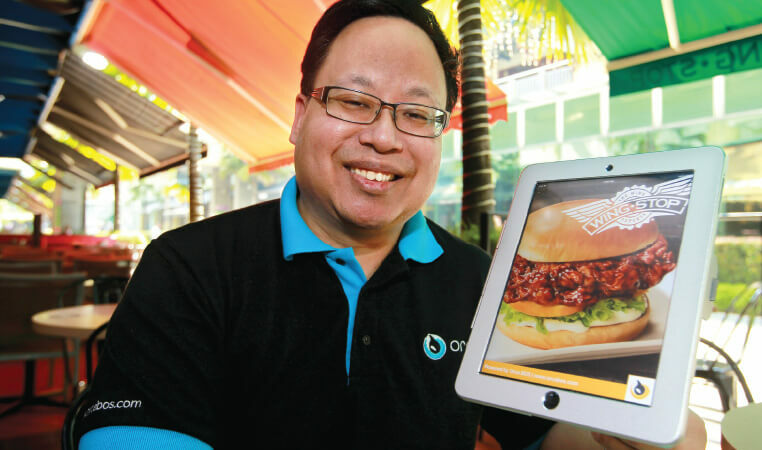 Koh spun off a new business, Habitat Blue Sdn Bhd, to develop software that helps restauranteurs manage their outlets and staff more efficiently. The company was incorporated here simply because its first customer was Malaysian. Habitat Blue developed Orca — an end-to-end solution to help F&B outlets provide a more standard customer experience. “We came up with the idea four years ago. When we started, we just wanted to remove the frustration between the front of house and the kitchen,” says Koh. It is a question of how the information is conveyed — from the customer to the wait staff and from the wait staff to the kitchen. “When I point at something on the menu, it is usually fine. But when I have complicated requests such as ‘no onions, no chillies or no garlic’, the requests could be missed,” says Koh. In such cases, there is a clear difference between restaurants that have a system and those that do not. “When it is not busy, it is fine. But when it is, it becomes a nightmare and the kitchen becomes a war zone. You have waiters being screamed at by the customers. And when they go to the kitchen, the chef also scolds them. After some time, they end up quitting, which is bad for the business owner because it is not easy to find experienced waiters,” says Koh. An experienced waiter is not just someone who can take your order and relay it to the kitchen. “They need to be familiar with the menu and recommend to customers what they should be ordering,” he says. It took Habitat Blue about nine months to develop the first iteration of its product. “We were not from the F&B industry at all. So, when we showed the solution to the chefs, 80% of them told us it wouldn’t work,” says Koh. The first product was too clunky. Waiters would need to transfer the orders to the point-of-sales (POS) system, which would be an additional step for the cashier. When there were customers waiting in front of the cashier to pay their bill, any additional steps that slowed down the process were unwelcome. “We decided to build a POS system and that took another nine months. So, 1½ years after we began, we had a waiter system, a kitchen system and a POS. That was when the real challenge began,” says Koh. 1 Utama Shopping Centre. And that was when things got interesting,” says Koh. Parkson ended up investing US$4 million in the system through Parkson China and made all of its F&B outlets convert to the Orca system. “Overnight, we had 30 stores using our system,” says Koh. As Habitat Blue delved more into the F&B business, it saw more areas to be tackled. “If you look at the whole cost structure of running a restaurant, about 30% of that is manpower. The use of our tablets (to self-order) would take away part of the front of house cost. The other 30% is rent, but there is nothing much we could do from a systems point of view, to help with that. The other 30% is your food costs,” says Koh. The additional 10% is a lot in an industry where margins are low. “We started to look into inventory systems. If I could control the orders from the customers, I could control the orders from the supplier as well,” says Koh. Basically, the system forced the restaurants to place their orders on the same system. When the goods were received by the outlet, it would show up on the system. And inventory could be reconciled with sales to see where the outlet was over-ordering (which led to storage and freshness issues) and where it was under-ordering (which led to items on the menu not being available when customers ordered it). How much does all of this cost? “Everything is modular. We have something for start-ups that do not have a lot money, all the way up to restaurants that are founded by more established F&B owners,” says Koh. A start-up could pay as little as RM80 a month for a basic system while a more established restauranteur could pay about RM300 a month. This does not include the cost of the hardware, which could be below RM2,000 to about RM35,000. Most business owners just don’t have the time to do this. “That is why when most people choose a location, it is usually based on referrals and online research,” says Koh. Habitat Blue is working on a solution in which business owners can actually do research about a certain location and get ground proof about the traffic flow in the area. It will include information such as whether there are schools nearby, how many parking lots there are and whether these are conveniently located. “The machine can be run round the clock and you can collect the data for more than two weeks without hiring someone to actually sit there. At the end of it, you analyse the data and make your decision,” says Koh.